Apple has announced the latest update to its hugely successful iPhone range at its Worldwide Developers Conference in San Francisco. 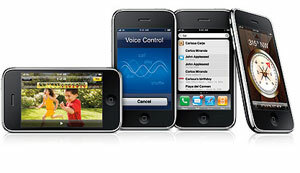 The new iPhone 3GS offers several new features and upgrades, including onboard memory capacity doubled to 32GB, voice activated dialling, MMS messaging, 3-megapixel camera, a digital compass, Tom Tom compatibility and – finally – the ability to record videos and copy and paste text. “The iPhone has changed how people think about their phones – it wasn’t too long ago that people were frustrated with these… what I’ll call crappy devices,” boomed Apple vice president Phil Chiller, at the launch. “The “s” stands for speed – because it’s the fastest, most powerful iPhone we’ve ever made”, he continued. Although there’s no denying that the new 3GS looks to be a well-rounded phone, resplendent in Apple’s seductive interface and magnificent design sheen, we can only marvel at the company’s ability to keep people whoopin’ – and forking out – for features which have been standard on most smartphones for years on end. The compass feature was seen in the first-gen Android G1 phones, and things like video recording and MMS are so mundane as to barely pass comment on most phones. However, you can’t argue with the phenomenal sales figures, with Apple shifting more than 20m units since launching in 2007. For the first time on non-Jailbroken iPhones, users will be able to ‘tether’ their phones and use them to connect their laptops to the Internet, much like a 3G dongle. In the UK, O2, appears to have retained its exclusive rights to to sell the iPhone, although their pricing of the new iPhone 3GS makes it a very expensive proposition. We can’t say we found ourselves tempted by the prospect of shelling out a hefty £275 for the handset on top of a £35/month tariff on a lengthy 18 month contract, offering just 500 texts and 600 mins talk/month. The 24 month contract seems even more of a rip off, working out at £175 for the handset and then £35/month for the same mins/text combination. For two years! Ouch. Although these tariffs include unlimited data and wi-fi, customers will be in for another slapdown if they want to use the tethering option, with O2 charging a hefty £15/month for 3GB data use and £30 for 10GB. However, there is some good news for recession-hit shoppers, with Apple reducing the price of their basic iPhone 3G with 8GB of memory to $99 (£61), on contract. Overall, we’re feeling pretty much underwhelmed by the iPhone 3GS. Although Apple have finally put together a phone with a full feature set, it’s a a very pricey upgrade and we’re not seeing a great deal of innovation for the extra bucks. The 32GB of memory is a nice touch, although we’re not sure we’d ever really need that much, and the camera still seems low powered for the high end price. Right now, we’re still eyeing the Palm Pre with more interest. It may not have ten zillion apps sitting in its app store right now, but the small form factor, full multitasking and innovative interface is keeping us intrigued. A lot of what you mentioned above are part of the 3.0 firmware, not the 3Gs. Yeah, it makes it even less impressive in a way. Really, there isn’t much to it. Faster speed if it’s supported, hardware for the compass feature, faster processor. The iPhone is mainly all software. This is a minor hardware update to add some new features and those that want them enough will fork out for it. The rest of us will probably be happy with what we have. I have an iPhone 3G and had a chance to play with Pre. The Pre hang on me while I was trying the much touted multitasking/cards feature. Also, it feels slower. 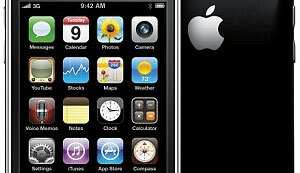 I think that the current iPhone 3G is better than Pre. I also had a sneak peak at the 3G S. It is a worthy update! I think all the buzz about Pre is going to fade out soon. People were just desperately looking for the next iPhone killer and Pre seemed to be the best contender. In few weeks everybody will get it: it is an unpolished beta-quality product, and while Palm gets it fixed (if ever) Apple will be two years ahead. Move to the next iPhone killer, please! @Charles … I mostly agree with you, but am awaiting the full dismissal after seeing it. Particularly I think the most interesting enhancement is the video side – shoot _and_ edit on device (with their Final Cut experience) sounds like a very interesting step. Apple have by default/allowance of an open platform enabled audiocasting via apps like AudioBoo … if they get video-capture sorted, they’ll stretch their lead in media capture way ahead. @Andy – Wow. Yet to have our hands on a Pre. Perhaps they’re doing what Nokia did the the N95? Release a less than finished product in one market; let them suffer it; then widely release a much improved product to the rest of the world. Kind of happy the US is the guinea pig rather than the UK this time.